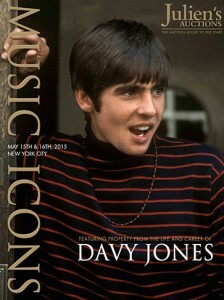 Davy Jones, George Harrison and Elvis Presley’s items go up for bid May 15-16. Elvis Presley’s tour bus, George Harrison’s guitar, and items from The Life and Career of The Monkees’ Davy Jones, go up for auction at The Hard Rock Cafe in New York City May 15-16. Michael Jackson’s glove, an American flag tank top worn by Madonna and a black crown worn by Beyonce in her “Haunted” music video will also go on the block at the iconic Hard Rock. The 1976 Crusader MCI bus emblazoned with the TCB, or “Taking Care of Business” logo, is accompanied by original paperwork from Presley’s purchase. Tour the interior of the bus HERE. Harrison’s Mastersound, a Maton electric guitar, is another of sale’s premier items and could fetch much as $600,000. He played the Australian-made guitar in 1963 throughout the United Kingdom and at the Cavern Club in Liverpool. As for Jackson, in addition to the glove, fans of the “King of Pop” will be able to purchase his hat and sunglasses. In total the rock memorabilia could bring an estimated $4 million. Other items, including an Eric Clapton vintage Les Paul, can be previewed HERE.